It’s all relative though. I was above average, but not elite. That is my dream — to become an elite and world class athlete…to be honest with myself, it’s to be an Olympic athlete — that’s hard to say out loud — and the Olympic Trials will get me the closest to that dream! That was 2005, when I dove headlong back into it. So I made this decision: I’m going to grab this by the horns, I’m not going to let bad relationships get in the way anymore, and I’m going to do this for me. I made this decision right before I met Susan Williams. It was very timely. Susan had just won the bronze medal for triathlon in Athens in August 2004. I met her in January, just as I was starting to get into triathlon. Triathlon hasn’t been an Olympic event for that long, correct? Yes. The first year was Sydney (2000). To date, Susan is the only US athlete, male or female, to have medalled. She is one heck of an athlete. She’s an animal. And yet she’s the most humble athlete I know. Over time, she became my role model for the kind of athlete I wanted to be. I saw her give a presentation and went up to her afterward and said I needed a coach and asked if she was available. She was. I did end up telling Susan, sheepishly, that I did want to make it to the Olympics, at that time thinking in triathlon. “I know I’m old, and this is silly, and it’s crazy of me to say, and don’t make fun of me. But you did it.” And her response was, “Who am I to say that you can’t go to the Olympics?” Yet I was not competitive in the swim at all. It seems like swimming is often the weak point with triathletes I talk to, especially the strong runners. They just don’t like swimming or they can’t get better at it for some reason. Uh, huh. Susan progressed me quite a bit, but there’s no way I would have been ready to race an ITU (International Triathlon Union) race as a pro in international championships where you build up your points for the Olympics. She did progress me quite a bit. But that’s where I realized, over time, that long course was my strength because of my run. I realized that I could make up a lot of difference in time [over competitors] with my run, what I lost in the swim. I was an average biker, maybe above average, but certainly not competitive. In triathlon, it seems like there’s variation in distances and even what the events are called. What exactly is a long course? What are the three distances? I can see why that would be confusing to someone outside the sport. Sprint distances vary a little bit. The Olympic distance is always the same. 70.3 is a half ironman — you race 70.3 miles of swimming, biking and running. Then there is long course, which has varied between different world championship races — anywhere from double Olympic to 3/4 of an Ironman. And then there’s ironman, and that’s always the same distance. How does the 70.3 break down among the three events? It’s exactly half of an ironman, so it’s a 1.2 mile swim, a 56 mile bike, and a half marathon run. So what’s a long course breakdown? Long course, as you pointed out, varies. When I was competing on Team USA, in France in 2007 it was a double Olympic distance. That ended up being around a 3000 meter swim, a 48 mile bike and around a 20K run [it was actually a 12.8 mile run]. But the next year that I did long course Worlds in Holland, it ended up being I believe a three quarter ironman distance. It changes a lot. I think the run ended up being 18 miles. The swim was hellacious. No kidding, I think it ended up being, who knows, around a 5K swim. Oh, my gosh. It was in very heavy waves and lots of green seaweed. Apparently they had eel traps below us too. Any time I heard a squeaking noise underneath – it may have been a boat or something – I was convinced there were eels swimming underneath me. That was a two hour swim for me. It was crazy. Then I qualified for the next year, although I didn’t end up going. That was in Australia and ended up being double the Olympic distance again. I have always wanted to go to Australia, and to compete there to boot — what a dream. So, it’s quite the testimony of how important this Olympic Trials dream is that I sacrificed competing in a world championship race in Australia to chase the Trials. Same thing went for giving up Ironman Canada, which I was registered to race last August…another day! With that swim story, you’ve just convinced me never to do a triathlon. I didn’t really need convincing. But it sort of takes marathoning and makes it 10 times harder. Long course, or 70.3, is actually my favorite distance. It’s my best distance. I feel it’s harder doing a 3:30 marathon than a 5:30 triathlon. I feel a lot more exhausted after doing a marathon than I do after a half ironman. I think it’s because you change up the muscle groups [in triathlon], but you’re fatiguing that same set of muscle groups for the entire duration of a marathon. What does it mean to compete for Team USA? Do you have to qualify, and what’s required when you’re racing for them? Competing on Team USA is one of the biggest honors and achievements I’ve ever had — to represent the U.S. in a world championship triathlon against many other international teams. Team USA is comprised of the top triathletes in the nation in each age group, ranging from the teens up to the 70’s. And, there is a Team USA for each triathlon distance or discipline — Sprint, Olympic Long Course, and duathlon. You have to qualify for Nationals first. It may have changed, but I believe qualifying in the top 10% of your age group in the same distance qualifies you for Nationals. At Nationals you have to place in the top 16 in your age group to make Team USA and compete in the world championship. When I qualified for Team USA for the Holland World Championship in 2008, I had to make the top five at Nationals. So competition was stiff. The requirement is to wear a Team USA designated race uniform, which has your last name on it, like the pros. It’s fun! And participate in the “opening ceremonies” called the Parade of Nations with your team wearing our Team USA shirts, carrying our country’s flag. It’s quite an exciting honor, and we get to play Olympic-wannabes. It really was awe inspiring to see each country’s team in their team shirts and country’s national colors, carrying their flags, parading down the street one country after the other. And spectators cheered us on as if we were Olympic athletes. It was fun getting a feel for what it would be like in the opening ceremonies. How long did you compete for Team USA? I competed on Team USA in three World Championships. One was Olympic distance. Two were long course. And I qualified for two others that I didn’t go to — Australia last fall, which killed me not to go to, and the newly popular Clearwater 70.3 Ironman series World Championship. Did you get any sort of special support from being part of that? Stipends or anything? No, not really. Not financially. Just the honor to compete for my country. You wrote to me that you were “talked into” your second marathon in 2007. What happened there? It had been about 11 years between marathons. Once again, this Olympic dream was popping back up. 25. No, too old. Thirties. No, too old. This was the last time, this switch from triathlon to marathon, that it popped back up. It was like this dream won’t let me kill it. 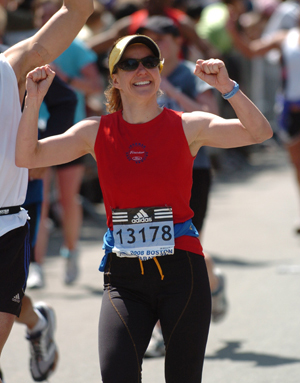 [After the first marathon in 1996] I didn’t really feel the need to do a marathon ever again. At Worlds, in France , that was the year, as my Mom says, “I found my feet.” For some reason, speeds were happening for me that year I don’t know how that happened. It just happened. Wouldn’t it be nice to know why? I know! We chopped 6 minutes off my 10K time in a triathlon in less than one year and I asked Susan, “What have we done to make that happen?” Her response was, “I just think you’re a natural athlete.” And, while I loved her response, I know it wasn’t a natural thing. It was something we were doing. Maybe the hill repeats? I don’t know. But I was flabbergasted. He said I should try and that I should come qualify for Boston with him. I said, “Oh, that takes a lot of training. I remember how much training that took for that first marathon.” And he said, “No, it’s already in you.” So we trained for 5 weeks, did the California International Marathon [CIM] in December of 2007. That was my second one after 11 years. And I did qualify for Boston with a 3:33 (which, ironically, is a very special number for me). I said I’d run it with him. But we’d also signed up for Ironman Arizona. Boston happened to fall one week after Ironman. And it was his tradition to do Boston ever year. You kind of have to be to be in this sport. At least triathletes are crazy. I was not coaching with Susan at the time. She will say to this day, “If I’d been coaching you at that time, I never would have let you do that.” That’s when I discovered injury. I’d never been injured until then. I can’t say I’m surprised. Were you actually injured during the marathon, or did it happen afterwards? I’ve been able to wing things in the past. And, like I said, I’m usually up for a good challenge — it’s that sense of determination that I have. I ended up getting patellar tendonitis, which interfered with my run training. So I didn’t get adequate run miles in. So I figured I could just walk the marathon if I had to. So I went into Ironman with the patellar tendonitis. Ironman was miserable. You cannot wing an Ironman. You just can’t. Well, you can’t really wing a marathon either, so I can’t even imagine trying to wing an ironman. I had just 5 weeks of training for CIM and qualified for Boston, so I thought maybe I’d just go on my residual fitness from the last two years I had built in training. It’s not that I’m stupid. I’m just determined. Was this the Ford Ironman Arizona race? You’ve got a 14+ hour finish time. That’s not a great finish time, I take it. Let me preface by saying that finishing an Ironman is quite an accomplishment for anyone. That’s huge! But, for me, no, 14+ hours was not good. I was aiming for and believe I had the ability for an 11 hour Ironman. That was a bad race for me for all apparent reasons. Ironically, my swim was the best that day and I enjoyed that the best. I remember swallowing hard at the pre-event dinner when watching a video and the voice-over said something to the effect of, “this is a race where the ill-prepared will pay.” I said, “uh-oh” and I did pay. I was like Norm of “Cheers” at every med tent. “Hey, Jill! You’re back!” And I’d be laying on my back for 20 minutes, or on all fours trying to throw up. I visited every porta-potta with diarrhea. That race had the third highest dropout rate in Ironman history. It was 95 degrees (after training all winter indoors) and up to 25 mph winds. It was just messy all around that day. But I did finish, and that was a huge accomplishment for me, given the spotty training. It was one of the worst and one of the best experiences I’ve ever had. And, I learned a lot about myself, my drive and what more we have within ourselves just when we think we don’t have any left. It truly is an amazing experience, even as miserable as I physically felt. I didn’t even notice these dates. You ran Boston a week later and your time wasn’t really that bad, considering. A 3:38. That’s part of what made me want to pursue this “marathon” thing. I wondered how far I could take this if I actually trained well and nurtured my run. We both knew it wasn’t the smartest thing, but it was a week apart and we wanted to go. We figured we didn’t have to race it and we could just walk it if we had to, or just run/walk. Just get through it and not worry about it. You still did okay, though. You were running around an 8:20 pace. Did you start off fast and then drop off toward the end when you started having problems or were you running a fairly even pace? There was a dropoff because I was in a lot of pain in that last 10K. And not because of the typical “wall.” It was really the last half, but mostly in the last 10K because of the IT band pain. I forgot to mention that the day before, we watched the women’s Olympic Marathon Trials in person. My boyfriend had said. before we even went to Boston, “You should go for the Olympic Trials. You have it in you.” And my wheels started turning, thinking, “Where did he get that from? What the…?” And then I started thinking of this dream I kept dismissing, that kept popping up. And I thought, “Well, maybe that’s the route — through marathon. Not triathlon.” It took about 7 more months after that before I embraced going for it. It was so awe inspiring. We watched Deena Kastor come in first and get the American flag wrapped around her. She looked so fresh that she could run another marathon. We watched Joan Benoit-Samuelson come in, and that was so awesome. The crowd just roared. I didn’t know much about these figures at that time in the marathon world. I probably didn’t even know who Deena Kastor was at that time. But, wow, it was so inspiring. And then the wheels started turning. And a disastrous full Ironman a week before. I’d say it’s better than not bad. It got me thinking: I wonder what it would be like if I actually trained. If I really focused on it and got some good, strong training. Not just 5 weeks, but really put my mind to it. Focused on and really nurtured the run. So I kind of kept it to myself and mulled on it from time to time. I did long course Worlds in Holland that fall. I was going through a breakup and depression that squelched my training. But it was soon after that, November 2008, that I went to Susan. I couldn’t let that idea go. Now the boy’s gone and what do I do next? Maybe I can and should actually go for the Trials. It would give me something to do. Something to focus on. And it would get “me” back. So I went to Susan and said, very sheepishly, “What would you think if I went for the marathon trials?” I completely trust her, as she does not give a compliment unless she means it. But she said very enthusiastically, “You can so do that!” Shocked at her great confidence in me, I said, “Really? Well, let’s go for it.” And, that was my defining moment where my training, and my identity as a triathlete, started to shift. I just believe God put Susan in my path as she’s a huge reason for my inspiration and pursuit of my dream — she’s walked alongside me, encouraging and believing in me the whole way. And still encourages me as if I’m still her athlete. She’s such a gift! That was about a year ago. So what’s happened in the last year in terms of progressing toward it? I switched to Bob Seebohar, the 2008 Olympic Triathlon Team’s dietitian and elite triathlon coach, who’s also Susan’s business partner. I needed a lot of help with nutrition and trusted his expertise with the clout he has in the triathlon world. I didn’t know of any pure running coaches at the time. We switched to him and I told him my goal. But I wasn’t ready to let go of triathlon at that time. It was my passion. He said I could race [triathlon] in the 2009 season, but that we were going focus on my run, doing minimal biking and swimming. And just get through it in the racing, since I had enough background in [those two disciplines] to be fine. That’s what we did. 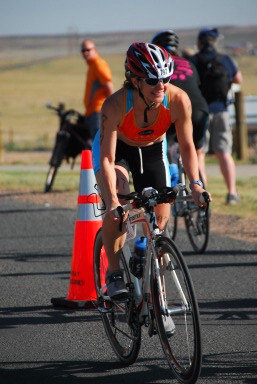 I even placed 7th in my age group at a very tough triathlon course — Buffalo Springs Lake Triathlon 70.3 — with barely any swim or bike training. My run alone carried me on that challenging run course, making up what I lost in a very average swim and bike split. I did three more 70.3 triathlons, another Boston marathon. Then Bob talked me out of doing Ironman Canada, which I had signed up for a year prior, and Worlds in Australia, because he said it would get in the way of my marathon goal. Although both those races were hard to let go of, I’m glad he did, as the Trials goal was more important to me. I needed to get away from triathlon. It took some weaning for me, because I really love the triathlon community, and I really love triathlon. But I’m glad I made the switch. The true focus on running started last August (2009). So, I’m pretty much a newbie. A crazy newbie with huge ambition and determination. Let’s talk about your last couple of races. You ran around a 3:22 in New York last fall. That was an issue day. Was that something nutritional that happened? For the most part. I was hoping to do a sub-3:10 in New York. I had gotten a terrible flu for the three weeks leading up to New York. Although never diagnosed, some of my friends believe it was Swine Flu. In my third week, race week, I was regaining health. But, I’m sure my body was still a bit weak going into the race. Just one week prior to the marathon, I had trouble getting through 5 miles. Prior to my getting sick, Bob had gotten me very strong, very fit, very quickly. He also changed my nutrition plan to help me become more metabolically efficient, which I really had a hard time adjusting to because of my prior eating habits. His plan completely changed the way I ate. So I not only was recovering from a flu, but was adjusting to a new nutrition plan going into New York. I wasn’t carbo-loading like I was accustomed to because with Bob’s nutrition plan you don’t have to if you’re metabolically efficient. Apparently, I wasn’t yet. My body just didn’t have enough fuel — no glycogen stored up. And I was still weakend from having been sick. The first 14 miles were the fastest I had ever done in a long distance race. Because of Bob, I shaved off a full 6 minues at the halfway mark (1:33) from what I did in Boston just 6 months prior. I was consistently averaging a 7:00 mile through the first 14 miles and was on target for getting a 3:06-3:10. I felt fantastic. But then I bonked hard at the 14th mile and really struggled through the rest of the way. It was extremely painful. I just ran out of fuel. You were on track to run Boston this year, right? But then you got injured. Yeah. The goal was to break 3:00 at Boston to set me up for the qualifying race for the Trials. My goal was actually 2:56 and it appeared that we were right on on target for that. But, then I strained my soleus partly because of my attempt to change my foot strike, since I’m a heel-striker. Never attempt to change your foot strike without the guidance of a very knowledgeable coach. And partly because of my intense training. My PT, Mark Plaatjes, said the one leg was injured and the other was well on its way. My PT is amazing — he’s won 36 marathons in his life. and runs his own physical therapy practice in Boulder, InMotion Rehabilitation. I’ve shared my Trials dream with him, and it’s been wonderful having his support as well. He’s another one, along with Susan, who has fueld my motivation for the Trials. He, like Susan, tells it straight. And, when he said he thought my dream was feasible, I really took that to heart. Yeah, I know his name. He’s a former South Africaner, right? Yeah. You’re really tuned into that world. I wasn’t. I didn’t know anything about the running world. He’s a sweet man. I really believe he has healing hands, a gift with that. He’s the one who recommended Bobby McGee. Bobby McGee is a coaching legend, having coached Colleen De Reuck for 11 years, until 2000 [as well as the 1996 Olympic marathoner, Josia Thugwane, who won gold that year]. I think De Reuck just qualified for the Trials with a 2:32 or something. Yeah. She is the only female in CO who’s qualified for the A standard so far and she’s still running 2:30’s in her mid-forties. From what I hear, she seems to be pretty amazing as well. Questions for Jills’s coach, Bobby McGeeWhat kind of mileage would you like to get Jill up to eventually? Depending on how the system responds, 100+, hopefully. It is more a time thing, than a goal volume thing, really. If the progression remains uninterrupted and the body continues to respond effectively, that will be the aim. What’s your plan to get Jill to a sub 2:46? Do you have specific milestones you want to reach along the way as checkpoints? It’s a huge chunk of change, but the marathon is the place to do it when the forties are approaching – easier than hitting your running high notes in the 5K and 10K. Did I say easier? I mean more doable speed-wise. The endurance can still improve, but the strength/speed capabilities become compromised. Jill’s background is primarily as a competitive triathlete. Did you need do any sort of special transitional training, or did you just move her right into marathon training like you would any other runner? Every runner is different – with Jill there was the realization that she is a triathlete and that her relationship with run volume is very different to that of a pure runner. Even her previous coach had very fixed ideas about what her volume limitations might be. Mostly I look at type of injuries, current health status coming in and training history. Add to this a comprehensive process at getting to know the athlete’s body and mind. Unlike the shorter races, the marathon requires a singularity of purpose. Not many who succeed in the marathon do a lot of other racing; choosing the rather solitary path of a long term approach, steadily building resilience and resistance to fatigue through consistency and cyclically growing duration or “time on legs.” Once this response is achieved, then one can work on the specifics. The challenge with the 40+ athlete is recovery capabilities – nutrition and lifestyle management become that much more important. Too much recovery time required – from sleeping too little, or eating poorly, or dealing with emotional stress, for example – and the athlete detrains. It’s like filling a porous paper cup: too fast and the cup ruptures from the water pressure; too slow and the cup absorbs the fluid and ruptures. Get it just right and the cup fills and can be drunk from on race day! How are you structuring Jill’s training and racing to prepare her to meet the qualifying time within the next 18 months or so? I do not yet have enough data – it has been only 4 weeks – to ascertain what kind of a responder Jill is and what her regression rates are. However, having done this before (with an athlete approaching 50! ), I feel that building to 2-3 races would be best, rather than leaving it all up to one race. I follow the classic approach with building base miles until there is an optimal response and then accelerate the training to simulate the race. In between these 2 phases, however, we make sure that her running mechanics and strength and conditioning are such that the body can withstand the rigors of the specific work. I’ll also have a phase where we develop her “speed” capabilities, so that the actual marathon pace does not seem as fast when compared to her maximum capabilities. I also believe in a strength-based approach, so Jill will be doing plenty of hill work of various forms. You also coached Colleen De Reuck, an extraordinarily talented professional runner. What, if any, differences are there between how you coached Colleen and how you will coach Jill? I have not coached Colleen since 2000. (I coached her for 11 years prior to that.) When I started with her, she was about to quit as a runner and focus on a career in teaching. Apartheid had ended and she wanted to give the international circuit a go, and go to the Olympics. She was already an accomplished runner before I started with her, so the approach was quite different. She was a half marathon specialist and she wanted to qualify for the Barcelona Games in ‘92 in the 10K. South Africa only wanted one person in the 10K and that was Elana Meyer (who subsequently won silver), and so in a very short space of time we had to shift gears and go for the marathon. We had 6 weeks! She came in 9th. In Atlanta she was a great fit in the heat (where she is phenomenal) for the marathon and they selected her for the 10K! She went on to run the marathon in both Sydney and Athens as well. I attribute her resilience to her keeping it simple, staying healthy and never having done huge mileage in the years I worked with her. I now believe her mechanics precluded her from ever running as fast as I believe she could have in the marathon (2:26 was her best). She was world class and ranked number 1 in the world from 10K to half marathon, holding the world record for 10 miles and 20K at one stage. Now, deep in her 40s, she can still run a 2:30! With Jill it is a question of glory’s last stand – discovering a dream and having the talent to chase it. It’s much more about creating the highest peak we can in a relatively short span of time. What would you say is Jill’s greatest strength as a competitive runner? At this stage I’d say vision – it’s a big thing to nail your colors to the mast as she has and go for it. You haven’t been working with him that long, though. About two months now. I switched to him at the end of April. Mark actually said, looking back that he should have had Bobby train him. He trained himself. In his opinion Bobby’s the best in the world. Bobby also has huge clout in the triathlon world, so that’s a nice transition for me to go to a pure running coach who is familiar with my world of triathlon and understands triathletes. He understands what hinders triathletes in the run in terms of running mechanics. It’s my impression that the pure running world and the triathlon world don’t usually commingle and have completely different mindsets. I really appreciate that I have found a world class Olympic running coach who also has trained elite and Olympic triathletes. He gets both worlds. He speaks at seminars all the time to triathletes on sports psychology and running mechanics. I remembered his name from one of those appearances. And Bob’s friends with him too. So he has a foot in the triathlon world as well. And he coached Susan’s teammate, [triathlete] Barb Lindquist for the 2004 Athens Olympics. She was rated number one in the world. And Bobby is the one who trained her run. I was excited to learn this. Do you live near him? He’s in Boulder, so it’s about an hour drive to get up there. But, so worth it! So he’s basically distance coaching you? You don’t go train with him (or have him come to you)? The thing about Bobby is that he’s very invested. He jumps headlong into getting to know his athletes and likes to be hands on. He really prefers being in person. Bobby really has to see his athletes’ run mechanics. I have been so impressed that as his way to get to know me initially, he came with me to my first PT treatment to talk to my PT and came to my lactate threshold test. He took pictures of me running to thoroughly assess my mechanics. I would not say that he’s distance coaching me since he makes tremendous efforts to either come see me here, or to have me there quite regularly. He’s a thorough communicator and is taking the time to get to know every aspect of me. He assesses from all angles. I’ve been so very pleased with how involved he is — even sends me articles and such in the mail when he thinks of something he wants to share with me. I’m really blown away with his coaching style and feel tremendously blessed to have found him. Totally changing the subject – two of the other women in this series, Tammy Lifka and Julie Wankowski, have a coach with an interesting approach to structuring training. He has them do 5K training as preparation to go into marathon training. He has certain goals that he wants them to hit for the 5K – 18 minutes – before considering a qualifying time to be a reasonable goal. So he’s focused on getting them to an 18 minute 5K and a 1:20 half as his litmus tests for readiness. Do you have incremental goals like these that you’re trying to hit along the way? Since I was out of the game for three months in the spring because of my injury, Bobby started me back very slowly at base training to rebuild a solid foundation. So he reigned me back from any racing, speed or hill work for at least 6 weeks, which was smart. He was more focused on getting my strength and endurance back, and in this phase focused on increasing speed and distance at the same heart rate. This has been crucial before we could consider anything like you mention above. But Bobby’s approach is much different anyway, to answer your question. We are, however, building my 5K in training. For example, I did a 2x5K in today’s session in heart rate zone 2, and will build that to 5x5K as a good measure of predictability for my marathon pace. All the while watching my heart rate decrease as my speeds increase! We’ve just started into the next phase and are starting to incorporate some speed work, which I’m very excited about. I’ve been eager since time is short and I feel very behind. I have to keep tucking that pride away when it wants to pop up every now and then…like at my first 5K last weekend since base training, and I lost my 2nd place overall lead in the last .2 miles. This isn’t typical. But I think getting our pride knocked around from time to time is very good training in itself! I’ll get there! It sounds like he’s just trying to get you to a basic level of fitness first. And he wants to be very careful to do it right since time is short now. Are you running completely pain free now? Absolutely! Very excited about that. Bobby’s getting me strong again! I’m happy to be building the volume again. Can you give me an example of a typical workout? I’m not sure Bobby has a typical one — he’s certainly not cookie-cutter or formulaic. It’s all dependent on where I am and how I’m improving. But, perhaps a good recovery example would be 6×10 minutes in Aerobic Threshold zone 1 with 1 minute walking inbetween each. Each session starts and ends with a 5 minute walk. How many miles per week are you running now? I will hit above 60 this week, and climbing weekly. He does this interesting run/walk thing, which also gets more volume in. It might be: run 9 minutes, power walk for 1, repeating this the whole way through the run. He counts those as miles. He’ll have you start off power walking for 5 minutes and end with 3-5 minutes of power walking, and he counts those miles too. That’s a way to get your legs ready for higher volume. But, it’s also a way to maintain your pace throughout a session. Some elites actually use this run/walk technique in a race to stay ahead. Apparently, highly-accomplished triathlete Gordo Byrn utilizes this technique in racing. I imagine that also helps because you’re using different muscles. So it gives [your running muscles] some relief. Right. And, keeps the cardio working. Right now I’m training alone. Susan was my running partner last summer. That was really awesome. But everybody else is really fit and in racing condition. I’m in aerobic right now. I can’t get my heart rate up as much as I want to. I’m not supposed to. It’s like a horse wanting to get out of the gate. You must be really frustrated. Had you wanted to do the Bolder Boulder race? It must be frustrating to have a big event like that happening. That one, not so much. There are so many people there. But, yeah, like I mentioned, my pride has taken a bit of a beating lately, which again, can be a good thing. What was most frustrating was missing out on Boston this year, which I had trained the entire year for. And I had planned on breaking 3:00 to set me up for the qualifying race. What’s frustrating, and that I’ve had to learn to graciously accept, is that my timeline has been skewed now. And it will have to happen a different way. So I’m learning to trust the process, and it will come. Just not how I had planned it. I also believe that if God is the one who put this dream in my heart, then He will make it happen. I can’t rush that. All in due time. So, I am trying to sit back and just enjoy the ride as it unfolds. It sounds like there’s a lot of opportunity for racing where you are. Yeah. 5Ks, 10Ks, half marathons are a dime a dozen here. Do you think doing the shorter races will eventually become part of your overall training regimen? I don’t think he’s too keen on the 5K. Whereas Tammy’s coach is focusing her on the 5K, I don’t think he wants me there. Bob focused me on the 5K and 10K last fall as well. But I think Bobby is happier with 10 milers, half marathons – those longer distances. You work for a massage company, Elements Therapeutic Massage. Do you take advantage of the massage services they offer, to help you recover? I do. I get a massage once a month from the founder, Michele Merhib. I’m very picky about my massage therapists, and she’s great. You obviously had to do a lot of traveling for races when you were doing triathlons. Were they generally supportive of that? Or did you just use all your vacation time to do that? I actually started with Elements last fall, after I switched to running from triathlon. In the last two companies I worked for I found that both of my managers at those companies were threatened by my racing. I took all of my vacation time for racing. They didn’t understand that. Your vacation time is your vacation time – however you want to use it. Especially at my last employer, my manager wasn’t keen on that. He was worried and said, “What if you get sick? You’re not going to have any time left.” But, I didn’t usually get sick. Yeah, don’t they know that athletes don’t get as sick as people who are not athletic? I know! He really didn’t like it. He didn’t get it. In fact, I learned to just keep my mouth shut. The cool thing about Elements is that we’re very fitness oriented, very wellness oriented. I told them right up front about my dream for the trials, in the interview. Straight up front: “Is this going to be an issue, my training for it? Like if I want to go running during lunch, because there’s a trail head five minutes away, and it ends up being an hour and a half? Can I just make up the time on either end of the day? Do you have an issue with that?” I’ve never been up front about that before. And they’re fully supportive of it. That relieves me quite a bit. Before we started the interview, Jill turned the tables on me. It seems she had one question of her own. Jill: Is it hard for you [to do these interviews], since it was your desire to go to the Trials? Julie: I haven’t quite given up yet. I think it’s probably unrealistic, given that right now I’m sort of terrified of the idea of running a marathon again. And I’ve only got about a year and half. But I don’t really care. I always saw it as a complete longshot anyway. It’s okay with me if it doesn’t work out. If it becomes a vicarious experience, that’s fine with me. Jill: I’d love for you to jump in and try it along with us. Mine’s a long shot as well. Julie: I think that’s part of what’s been encouraging. I was thinking, “Well, I’m not in league with any of these women.” And, really, a lot of you aren’t that far off from where I got to before I started having some problems last year. So I’m thinking maybe it’s not a totally crazy idea. Either that or the rest of you are crazy. Jill: Maybe a little bit of both! Hopefully your journey in doing these interviews would encourage you to go for it as well. Julie: I have to say, a part of me would like to be the last interview in this series. So we’ll see what happens. Jill: How awesome would that be? Julie: That would be pretty neat. That’s great. I guess it’s a real testament to how important this is to you that you were willing to go out on a limb in a job interview by making it a requirement. Well, yeah. This is a dream. As much as I’ve been pushing it under the rug all these years and dismissing myself, I realized, “You know? I really am going to reach a point where I am too old. It will be true at one point.” This is my last chance. I’d better grab it by the horns and go for it as much as I’m able to and do the best I can. That means not choosing a job that won’t [support this]. It’s exactly half the salary of my last job, so it is incredibly tough. But they’re supportive and that means everything. It’s a mile from my house. It’s a mile from the trailhead. They’re openly supportive of it. It’s worth it to me to not have to focus on a stressful job, so I can really just go for it and give it everything I have. I think you’re not alone in that regard. I haven’t spoken to that many people yet, but I have a feeling that this is going to emerge as a theme. People have decided that for the next couple of years, they’re just going to put everything else on hold and not worry about career and just go for this. I think you have to at this level. Especially when I reach a point where I’m running 100+ miles a week. I need a job, like Elements, that is not stressful or requires additional hours outside the standard. I need to limit my stressors in every area as much as possible, and will need to increase my rest as well. It is difficult. I was doing 100 mile weeks last summer. I telecommute, but I work a 40 hour per week job and also do a lot of freelance work. It’s really hard. You just feel like you’re running all the time. You’re running in the morning and then you’ve got to work for 7 or 8 hours and then go running again. It can be quite draining. Well, and then you have to get your rest. It’s so crucial with all that running. If you’re not getting that between the time and stresses at work that add to the fatigue…yeah, that’s tough. Do you know anyone else locally who’s also trying for a qualifier? I don’t know anyone personally here. That’s why I really enjoy what you’re doing [with this series] because it is making me more aware of other people out there with similar stories. Here I thought some people might think, “You don’t have a run background and you’re 39. Who are you?” It’s really cool to see that there’s a lot of other people in the same shoes. But, no, the only other person I’m aware of is Tera Moody. And I’m not anywhere near her league. I know she’s not local either – she’s either living in Boulder or Colorado Springs, I’m not sure. She’s probably around 30, right? Early 30s, I think. And she has a sleep disorder. Oh, yes, I’ve read about that. That’s really impressive, that she can train at that level and not sleep. It really is. I’m the opposite. I need 9-10 hours when my volume is high. I’m sure she does too, but she doesn’t get it. No. She’s just amazing. I discovered her in January, right before my injury. It was the last race I was supposed to do, but I couldn’t do it because of my injury. I wanted to win that run. I remember looking up the results online to see who won it, and it was her. So I looked her up and discovered who she was – “Oh, that’s why she won it.” And then I was glad I didn’t show up. Ha! Any advice for others who are going after this? I would hope that anyone going after this would not allow distractions to get in the way. That’s been the biggest thing with me. I keep kicking myself. Just to go after it with your everything and not let doubts, excuses, naysayers, tough circumstances or negative self-talk interfere. Focus on the goal, like in a race, and don’t get distracted by what’s on the sidelines. Just go for it with everything you have and see where you land. Take it as far as you possibly can go. And I hope you’ll find it will be a worthwhile journey no matter where you land, because I believe it really is more about the journey and who we become along the way than it is about the outcome. I would like to encourage other people to go after their dreams, no matter how big, and to pursue their talents — they were given to each of us for a reason. When we use our talents, it just betters everyone. I really do want to encourage others. And you – I want to encourage you! That’s good. Because you’re not too old. I’ve used that one many times before. Well, I’m a good 6 years older than you are, so I really am sort of hitting the upper limit of sanity with this idea. But maybe not. You could show the world. It’s all in the head, right, with the thinking? It’s all what we put in our head. I hope you’re right. Well, aside from the interview, I’ve really enjoyed talking to you and I hope I can follow up with you as you move along towards this goal. Yeah, I’d love for you to. Next attempt: Not selected yet. Candidates include: Wineglass (Corning, NY), London, Berlin, Houston.